Of all the onsen resorts in Gunma, this one stands out for its dynamic, wild atmosphere. 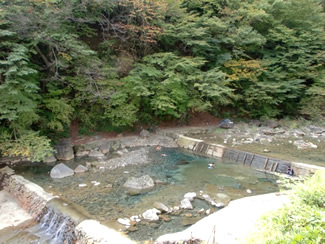 It's a Rotenburo open-air bath made by damming up river waters. Shiriyaki literally means to burn your buttocks. Read more to find out the story behind the unique name.